I’ve been at the annual American Political Science Association #APSA2017 meeting this week and I’ve been thinking about my two decades as a political scientist. Part of it is the fact that I have attended an array of focus groups and started off with the Women of Color in Political Science Conference #wcps17 in San Francisco, California. #APSA2017 has been fraught with so much awesomeness and introspection. The focus groups have caused me to reflect on my time in Political Science. I’ve had some strong mentors and some great experiences; however, I’ve also had some interesting or terrible experiences. And, from the focus groups, I know that these situations and anecdotes are more systemic in higher education and perhaps not unique to Political Science. I want to blog more about this and this brief post is only part one. I’ve seen the #wineWeds and #whineWed tags on Twitter and both have made me smile. Although I do prefer the sarcastic #whineWeds tag. Lately, I have followed the #wellnessWeds tag on Twitter and other social networking sites. I am trying to spend any extra time thinking about the positive and surrounding myself with people who really bring me joy. Yes, I have read Marie Kondo’s books and I have decluttered lots in my house, and other parts of my life. There is something truly liberating for me to be able to protect my time. Recently I was at a regional conference in my home discipline and I took special care to protect to my schedule, and outside of conference commitments I was very careful with any extra time that I had. I brought along some work and I needed to take care of it. I read reports, and graded in the sun, and kept up with my email. I also attended fewer obligatory receptions, and I am fine with that. I was in charge of my time. I did get some networking in, but it’s not the feverish networking of someone who is looking for work and trying to make all the connections. I’ve been there. I am hearing from vendors or other partners about the need for a conference call and the one to three day warning for the meetings is not enough. The emails that note ASAP are not a priority for me and my time. The people who I work with regularly and have access to me and my time do not need to flag the message as important. It is often the vendor or someone who has not planned their time well, who uses that flag or note. I need to balance my work and it is getting easier for me to offer a polite no and suggest the call or meeting for next week or the week after. So, on this #wellnessWeds I lift up my coffee and say, “Protecting your time, protects you.” It is perfectly acceptable to say, No. No, I am not available. No, I will not engage with you. No, I will not respond to your passive aggressive email with a passive aggressive response. No. But, always say yes to Tacos. My normal routine is to read the local paper and then one of the national papers. 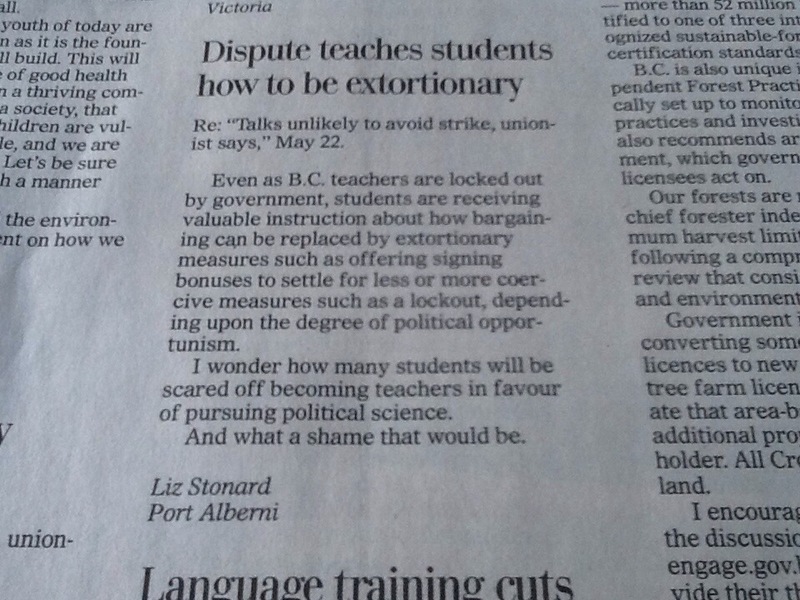 I was on my third cup of coffee and came across the above letter to the editor. I had to smile. I was in a former student’s class earlier this week speaking to the upcoming American mid-term elections and social media in politics. My former student is finishing up his student teaching and had taken courses with me in Political Science. He is one of many former students who has chosen to go into secondary or post-secondary teaching. Many of my former students are also serving in public office or doing other non-partisan work for the government. The letter writer’s binary is a false one and I am sympathetic to her easy comparison; however we cannot assume that all politicians have a Political Science degree. Over the course of 17 years of teaching my students have gone into virtually every sector of the economy. I am seeing more work in communications and the tech industry lately, but overall, they are everywhere and hold a Political Science degree. And, many of them are double majors or took a minor in another field in order to round out their education or pursue multiple areas of interest. During my next 17 years, I hope to see this continue. When students ask me, “What can I do with my degree?” I answer that they can do almost anything–it’s up to them. The classroom or office hour experience is only one part of their education. My hope is that they will get involved in campus and local opportunities. Political Science is diverse field with many sub-fields and I am proud to call myself a Political Scientist. I am also proud of my Political Science students. Keep up the good work! Acker, Sandra, and Grace Feuerverger. “Doing Good and Feeling Bad: the work of womenuniversity teachers.” Cambridge Journal of Education 26, no. 3 (1996): 401-422, doi: 10.1080/0305764960260309. Collins, Gail. “‘The Feminine’ Mystique at 50.” New York Times, January 23, 2013. http://www.nytimes.com/2013/01/27/magazine/the-feminine-mystique-at-50.html?pagewanted=all. Elley-Brown, Margaret J. “The Significance of Career Narrative in Examining a High-Achieving Woman’s Career.” Australian Journal of Career Development 20, No. 3 (Spring 2011): 18-23, doi: 10.1177/103841621102000304. Gaze, Beth. “Working Part Time: Reflections on Practicing the Work – Family Juggling Act.” Law and Justice Journal 1, no. 2 (2001): 199-212. http://search.informit.com.au/documentSummary;dn=755722715628569;res=IELHSS. Goeke, Jennifer, and Emily J. Klein and Pauline Garcia-Reid and Amanda S. Birnbaum et. al. “Deepening Roots: Building a Task-Centered Peer Mentoring Community.” Feminist Formations 23, no. 1 (2011): 212-234. http://muse.jhu.edu/. Kreider, Tim. “The ‘Busy’ Trap.” New York Times, June 30, 2012. http://opinionator.blogs.nytimes.com/2012/06/30/the-busy-trap/. Mills, Melanie Bailey. “Intersections between Work and Family: When a Playpen Can be Office Furniture.” Women’s Studies in Communication 31, no. 2 (Summer 2008): 213-217, doi: 10.1080/07491409.2008.10162535. Samek, Alyssa A. and Theresa A. Donofrio. “‘‘Academic Drag’’ and the Performance of the Critical Personae: An Exchange on Sexuality, Politics, and Identity in the Academy” Women’s Studies in Communication 36, no. 1 (2013): 28-55, doi: 10.1080/07491409.2012.754388. Armstrong, Sally. Ascent of Women. New York: Random House, 2010. Baker, Maureen. Academic Careers and the Gender Gap. Vancouver: UBC Press, 2012. Cote, James E., and Anton L. Allahar. Ivory Tower Blues: A University System in Crisis. Toronto: University of Toronto Press, 2007. Evans, Elrina, and Caroline Grant, eds. Mama PhD: Women Write about Motherhood and Academic Life. New Brunswick. N.J.: Rutgers University Press, 2008. Jalalzai, Farida. Shattered, Cracked, or Firmly Intact? : Women and the Executive Glass Ceiling Worldwide. Oxford: Oxford University Press, 2013. Krull, Catherine and Justyna Sempruch, eds. A Life in Balance? Reopening the Family-Work Debate. Vancouver: UBC Press, 2011. Newman, Jacquetta, and Linda A. White. Women, Politics, and Public Policy. Oxford: Oxford University Press, 2012. Noddings, Nel. Happiness and Education. Cambridge: Cambridge University Press, 2003. Noddings, Nel. The Maternal Factor. Berkeley and Los Angeles: University of California Press, 2010. Osbord, Tracy L. How Women Represent Women. Oxford: Oxford University Press, 2012. Robinson, Ken. How Finding Your Passion Changes Everything. New York: Penguin, 2009. Sandberg, Sheryl. Lean In: Women, Work, and the Will to Lead. New York: Knopf, 2013. Valian, Virginia. Why So Slow? : The advancement of women. Cambridge: MIT Press, 1999. @uvicpoli, Uvic, Political Science Dept. Huffington, Arianna. “Arianna Huffington: How to succeed? Get more sleep.” Filmed December 2010. TED video, 4:11. Posted January 2011. Katz, Jackson. “Jackson Katz: Violence against women—it’s a men’s issue.” Filmed November 2012. TED video, 17:41. Posted May 2013. Koyczan, Shane. “Shane Koyczan: “To This Day” … for the bullied and beautiful.” Filmed February 2013. TED video, 12:04. Posted March 2013. http://www.ted.com/talks/shane_koyczan_to_this_day_for_the_bullied_and_beautiful.html. Lemmon, Gayle Tzemach. “Gayle Tzemach Lemmon: Women entrepreneurs, example not exception.” Filmed December 2011. TED video, 13:16. Posted January 2012. http://www.ted.com/talks/gayle_tzemach_lemmon_women_entrepreneurs_example_not_exception.html. Pierson, Rita. “Rita Pierson: Every kid needs a champion.” Filmed May 2013. TED video, 7:48. Posted May 2013. http://www.ted.com/talks/rita_pierson_every_kid_needs_a_champion.html. Robinson, Sir Ken. “Ken Robinson: Changing education paradigms.” Filmed October 2010. TED video, 11:41. Posted December 2010. http://www.ted.com/talks/ken_robinson_changing_education_paradigms.html. Sandberg, Sheryl. “Sheryl Sandberg: Why we have too few women leaders.” Filmed December 2010. TED video, 14:58. Posted December 2010. http://www.ted.com/talks/sheryl_sandberg_why_we_have_too_few_women_leaders.html. Stokes, Colin. “Colin Stokes: How movies teach manhood.” Filmed November 2012. TED video, 12:53. Posted January 2013. http://www.ted.com/talks/colin_stokes_how_movies_teach_manhood.html. Many thanks to Ms. Sylvia Alves for her assistance in curating this array. This is a draft and please share, but note that this is from the two of us! 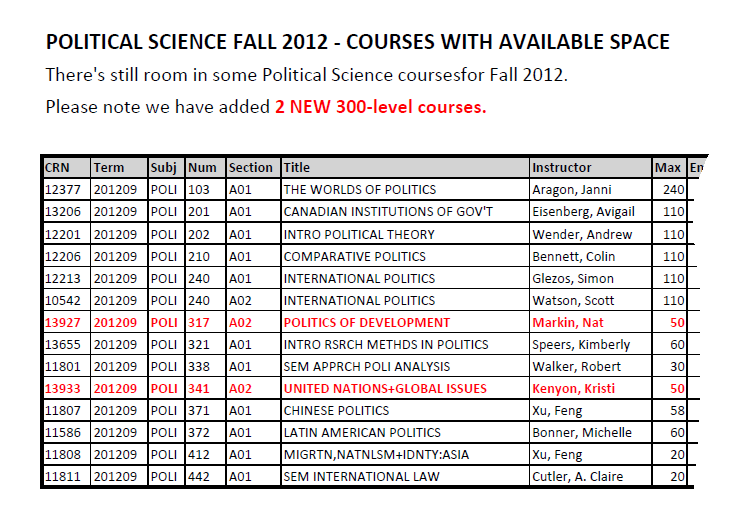 As you can see we have some new courses, too! Remember that getting on the waitlist can work to your advantage–just go to class. Many students enroll in 6-10 courses, but “shop” during the first two weeks. Good luck! An academic conference provides the more than the venue to present your work and hear other presentations. It also is a great place to network and make connections, as well as learn from colleagues in the field. This post makes suggestions for a successful conference appearance. I know that the Western is this week and ISA is at the start of April. My hope is that this post will be useful for most. If you are presenting and need technology (a video data projector), do make a point of making sure that your needs are met. Likewise, always have a Plan B if the technology does not work. This means copies of your slides for you to refer to and handouts of any pertinent slides or related matter is also copied (introduction, findings and conclusion) for distribution. I gave a talk on campus last week and had my iPad, thumbdrive, Slide Rocket and Drop Box versions of the presentation; however, everything worked fine with my iPad. For graduate students, you should come with some business cards in hand. The standard in my areas of familiarity (Women’s Studies and Political Sciences) are that you can use the university crest and get cards printed. Please note that when you are writing your thesis, you are a candidate (for instance MA Candidate) otherwise you are a Graduate Student. When you have defended your prospectus for you dissertation, you are a PhD Candidate. You cannot put PhD on your card until you have defended or have your PhD in hand. I see that a few people have PhD on their Twitter profiles or blogs and they do not have this degree earned yet. This is misleading and unprofessional to do—don’t do it! Practice your presentation in front of a mirror or a friendly audience. There is nothing harder to do than to sit by and pay to attention to a terrible or wooden presentation. Don’t stare at your computer. If you must, place phrases in your document that read: scan the room, breathe, smile, look up, etc. This will help you add some semblance of connection with your audience. Speaking of which you could present to one person or have no one in your audience, but this still counts as a presentation for your vitae. Enjoy your presentation! Make sure that you take time to attend some of the receptions. This is a good place to network or catch up with others. Make sure that you are available to attend some of these events. The conference is not a vacation, but a working series of meetings. Take some time off, but your main job is to use the conference experience to help you share your research and meet people in your discipline. It is worth the time to meet people, too. I have found that some of my publications were thanks to a conference presentation, when an editor was in the audience or another panelist invited the panel to submit a special issue to a journal. Before your trip you also want to peruse the conference program well so that you can organize your daily itinerary of what you have to do. If your advisor, mentor or other faculty in the department are attending the conference, go to some of their talks. Ask them to introduce you to some people at an event. A good committee member or mentor, will do this naturally, but some people need the little nudge to do so. Also, try and meet other graduate students. These people will provide the cohort of scholars you will see at the conferences and it is worth getting to know them. The next few things are obvious: have fun, eat, sleep and exercise. Conferences are often 12 hour days and you want to make the most of them, but not work too hard that you return home exhausted or sick. Have a great time, but be careful to not drink too much. You are presenting yourself to others in your field. Likewise, be careful what you say on social media during the conference. Remember that your first academic conference might appear a daunting experience, but it is not if you plan well and take the time to network and attend conference events. Also, engage with others online via social media–this way you can also meet people prior to the conference and have a meet up. For the established academic, all of the above is obvious. But, let me add that we need to remember to make time to mentor. I try and take grad students out for a drink, coffee or a meal to chat with them about their progress. These brief meetings make a difference. I know that they did when I was a grad student. I’m re-visiting notes from my archival visit at Radcliffe. What do I remember? Wanting to use every precious minute, while they were open, so I would inhale a Cliff Bar surreptitiously outside the restroom and then return to the work of poring through the archival matter. The librarians were helpful with my repeated requests and made me feel like what I was doing was important. I can’t say that for all of my archival visits. (As an aside, Duke had the best staff and I befriended one librarian, who now is in Miami, via San Diego, and Los Angeles). A big, warm hello to Cristina Favretto! One of the best librarians I have ever met! We met at the Women in Higher Ed conference in Minneapolis many years ago. I need to back up and explain a few things. My dissertation examined women in Political Science, The Movement into the Academy: Women and Political Science. When I came to Political Science, after having earned a BA in Women’s Studies and a MA in Liberal Arts and Sciences, at first blush I thought that feminist Political Scientists were not that radical. And during the early years of graduate school, I occasionally second guessed the decision to pursue a doctorate in Political Science. I knew that my research work would focus on the qualitative and not include multivariate regressions or the need for SAS or SPSS. But, the focus on statistics and on work that I never really pursued pushed me harder into Political Theory and Gender and Politics. I’m glad that my dissertation chose me. I realised that the foremothers, if you will, in Political Science were not seemingly behind. With the archival work I found that they were fighting similar fights that feminist colleagues were fighting in different departments. In some instances, the struggles were worse, but never isolated. Here, I am referring to the Chilly Climate and other ways that women faculty were made to feel isolated in academe. Playing academic detective in the archives and attending networking events within Political Science certainly humbled those initial beliefs about my sisters in Political Science. I was humbled to find that the establishment of the Women’s Caucus for Political Science (WCPS) in 1969 preceded most other disciplines caucuses for women. However, it was shortly thereafter in some instances weeks at the other disciplinary annual meetings that similar caucuses and status of women committees were founded. The WCPS was instrumental in being a resource for women in Political Science. The women’s movement did not pass Political Science, as it was part of it, too. But, it was only through my archival research at Radcliffe, Smith and Duke that this full picture became clear. Sure, some books have examined particular campuses and their historic struggles, but by and large I imagine that most Political Science students think that the women’s movement of women’s liberation movement on campuses really took place in departments of Women’s Studies. Sadly, they would be wrong. There were coffee klatches at community centers, as well as campus student union buildings. As a matter of fact, it was during the heyday of the movement that Women’s Studies departments or programs were founded. So, there were allies across campus, as Women’s Studies was in its nascent form. I am proud to be an alum of San Diego State’s Women’s Studies department, the first Women’s Studies department. But, I know that when I sat at the 30th anniversary dinner in 1999 I felt proud to have benefited from the hard work of those initial five women who were brave enough to take a stand and form the WCPS. I must have missed the 40th anniversary celebrations, but nonetheless I know that in my work and mentoring I and so many others continue their hard work. If anything, I have learned that there are important allies across campus and that there is a helluva lot of great work being done in Political Science.